People visiting the Old Town Nice in Provence, France are amazed at the Baroque Facade of the Cathedrale Sainte Reparate. The lovely Baroque facade of the Cathedrale Sainte Reparate near the Place Rossetti in Old Town Nice in Provence, France, a landmark of the Vieux Ville. The cathedral was built in the middle of the 17th century and dedicated to a young Palestine martyr.Cathedrale Sainte Reparate, Built in 1650, Old Town, Nice, Provence, Cote d'Azur, France, Europe. 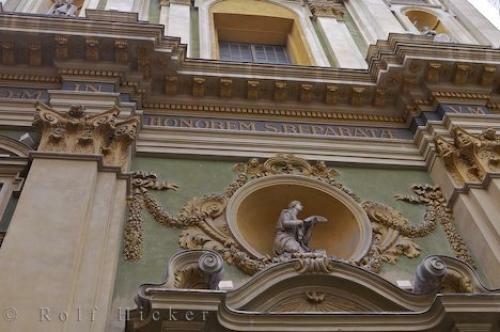 Photo of Baroque facade of Cathedrale Sainte Reparate in Old Town Nice, Provence in France, Europe.